Seen on the Wood Canyon Fireroad in Pt Mugu State Park (Sycamore Canyon). See below. In last month's eNews, we described a problem of vandalism in the parks ("A Few Bad Apples"). Many trails are closed to mountain biking whether we like it or not, but not all closed trails are marked as such. And as last month's article documented, some "Closed to Biking" signs have been defaced or removed. As a result, the biking status of many trails can't be determined at the trailhead. To address this, we have create a list of trails that we know are closed to mountain biking. Take a look at this List of Closed Trails before heading out to ride, especially when riding in an unfamiliar area. Please ride only on open trails. Celebrate CORBA's 22nd Annual Fat Tire Fest! Sunday October 25th at Castaic Lake. Trail rides, treasure hunt, great prizes, win bikes and bike accessories, giant raffle, skills features, kids bike rodeo, hill climb contest, wheelie contest, bike limbo, great food, snacks, goodie bags, celebrity kids bike ride, pro skills clinic, music and more! Come out and join the fun! Support mountain bike trail access and have a great day on the trails! For more info contact: info@corbamtb.com or Louisa - mtbike4@verizon.net. To see photos of last years event go to the 2008 FTF Photo Galleries. Volunteers Needed - help with FTF fundraising campaign. Each year CORBA puts on the Annual Fat Tire Fest which is lots of fun for everyone and a chance to win fantastic prizes and great bike gear, but it also takes a lot of money! This year CORBA would like raise funds to cover the expenses of the Fat Tire Fest in advance so that the event can focus on pure fund raising for our great community programs and projects such as bike parks, trail building and repair, Youth Adventures and focus on fun for all! We are looking for 10 volunteers to contact 18 companies each. If you have some fund raising experience and time to help CORBA with this goal please contact Louisa Bonnie at: mtbike4@verizon.net or 310-374-7552. Thank you for supporting CORBA and mountain bike trail access! April 18 - California Trail Days at Wildwood-Stoneyvale, with lunch. 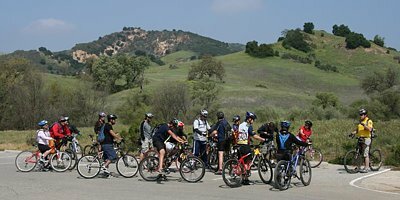 The USDA Forest Service and associated LARRD volunteer organizations will celebrate California Trails Day on April 18, 2009. The celebration will include 4-6 hours of trail work on the Wildwood-Stoneyvale area trails and a lunch to celebrate the event. This event is organized by the volunteer groups of the Los Angeles River Ranger District. Lunch will be held at the Wildwood Picnic Area and will include a short ceremony about California Trails Day. Lunch will be served at 1:00 PM. Activities will end at 3:30 PM. Note that this is not the Wildwood Park in Thousand Oaks. Details. Saturday April 4 is the next skills clinic. CORBA holds a recreational bike ride for beginners the second Saturday of every month, a week after the Skills Clinic. This is the perfect opportunity for the clinic attendees to practice their new skills! But you don't need to attend the Skills Clinic before you come on this ride; everyone is welcome. This is a great ride for first-timers to the CORBA recreational rides. The ride is in beautiful Sycamore Canyon (Pt. Mugu State Park), starting at the PCH end, riding 8 miles on nearly level fire roads and singletrack. 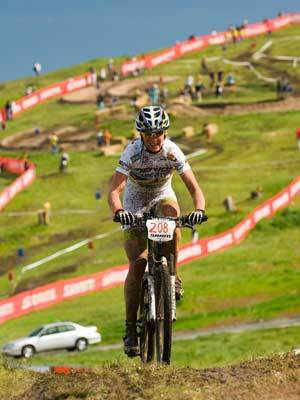 The ride leader will go over the basics of riding a mountain bike along the route. The next ride will be on Saturday April 11th, meeting at 9:00 am at the pay day-parking lot in Pt. Mugu State Park, just off the PCH. This Google Map will get you to the park kiosk (on the north side of the street); the attendent can direct you to the lot from there. There is a fee for parking in the park, or you can park for free along the PCH and ride in. Calling All Volunteers: SoCal Interscholastic Cycling League Needs You! 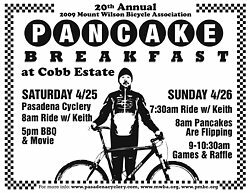 The 20th annual 2009 Pancake Breakfast fundraiser will be held on April 25 & 26 this year. Sycamore Canyon and other fireroads in Pt. Mugu State Park were graded during the last week of March. The good news is that unlike previous years in Sycamore and other mountain bike locales where grading meant earth movement of several inches with resultant crumble and dust, the recent grading left most our favorite rideable roads untouched. Along some short sections, the State Parks leveled out divits to enhance rideability and safety. Next time you see a State Parks ranger or employee on the trail, please give them a word of appreciation for a job well done. Alternatively, email CORBA at info@corbamtb.com and we'll collect your thanks and pass them along to our local State Parks Superintendents. From the San Gabriel Valley Tribune, March 15, 2009 - Work to clear thousands of tons of earth from the Mt. Wilson Toll Road has started, four years after the popular hiking and mountain biking trail was blocked by a huge landslide triggered by record winter rains. 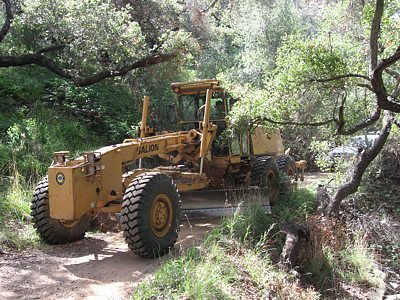 Funded by a $1.48-million Federal Emergency Management Agency grant, the work is "rapidly approaching the half-way mark," said Kevin Johnson, assistant chief of the Forestry Division of the Los Angeles County Fire Department, which is supervising the project. He said the steep trail is scheduled to reopen in mid- to late July. LA City Parks. A New Beginning? For several years CORBA has been asking Los Angeles City Dept of Recreation and Parks to provide some opportunities for legal dirt riding on LA Rec and Parks land. We don't have enough time to document the goings-on that have maintained the bike ban, but a new mediated discussion, with three bicyclists, three equestrians and three hikers, is about begin. City Hall says that the purpose of this group is to "increase mountain bicycling access." Former CORBA Steering Committee members Jim Hasenauer and Michael Goodman will be joined by Bicycle Advisory Committee member Aaron Kirsch to represent cyclists in this process. Our position is simple: The people of Los Angeles ought to be able to ride their mountain bikes on appropriate trails and fireroads in this great city. With the economy in the tubes, families searching for inexpensive fun recreation, with everyone worried about sedentary kids and the long-term health effects, promoting mountain biking ought to be simple. But where politics is involved, nothing is ever straightforward. We know anti-bike groups have already started organizing and there have been political moves that could be to the detriment of our access to some city parks. There may be a time in this process where we'll call on LA mountain bikers to speak up. Stay tuned. The 15th annual Bike to Work Day is coming on Thursday, May 14, 2009. LA Metro expects a record number of participants to enjoy a relaxing, healthy, green bicycle ride to work. To pledge and be entered to win fabulous prizes, or just to learn more, go to www.metro.net/biketowork. List of Closed Trails - March 24. These trails are closed to mountain biking. Please ride on open trails only.